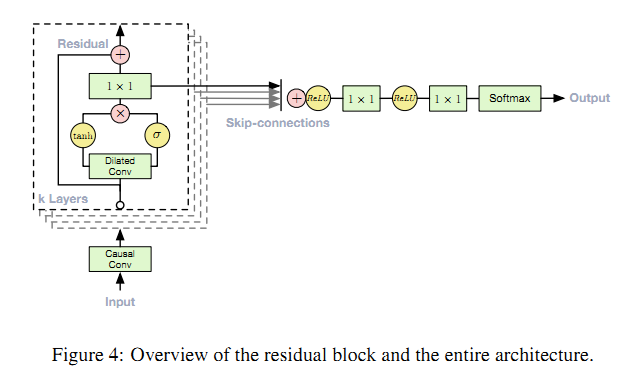 A complementary approach is to use a separate, smaller context stack that processes a long part of the audio signal and locally conditions a larger WaveNet that processes only a smaller part of the audio signal (cropped at the end). One can use multiple context stacks with varying lengths and numbers of hidden units. Stacks with larger receptive ﬁelds have fewer units per layer. Context stacks can also have pooling layers to run at a lower frequency. This keeps the computational requirements at a reasonable level and is consistent with the intuition that less capacity is required to model temporal correlations at longer timescales. 本文中，我们在三个不同的任务上（多人语音生成（multi-speaker speech generation ），TTS（text to speech），音乐建模（music audio modelling）），对wavenet进行了评价。生成的样本见链接：https://www.deepmind.com/blog/wavenet-generative-model-raw-audio/. 单个wavenet模型可以基于任何一位编码的发言者进行条件建模。单个模型有足够的能力抓取所有109位发言者的特征。同时，我们观察到，相对于单个发言者数据，增加发言者可以于使验证集表现提高。这个现象提示：This suggests that WaveNet’s internal representation was shared among multiple speakers.